SAN FRANCISCO--(BUSINESS WIRE)--JetBlue (Nasdaq: JBLU) is continuing its mission of Inspiring Humanity®. 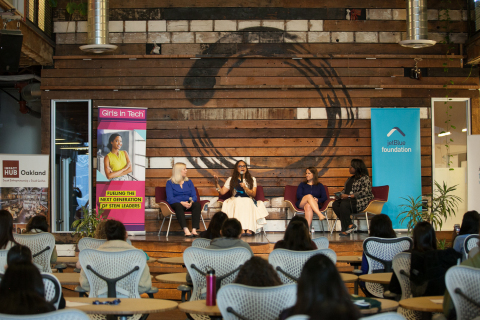 Last week, JetBlue partnered with the nonprofit Girls in Tech to host a special event designed to encourage young girls to be brave, dream big, and build. Girls in Tech is a global organization focused on the engagement, education, and empowerment of girls and women who are passionate about technology. 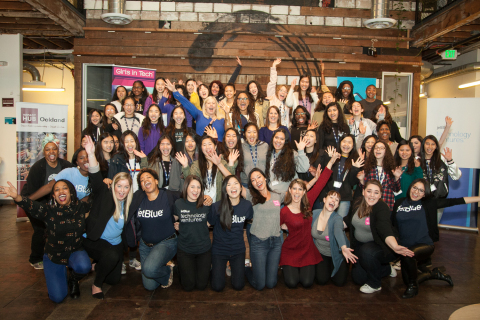 During the “Even More Girls – In Tech” event, which took place at the Impact Hub in Oakland, Calif., nearly 50 girls, ages 12-15 learned leadership skills directly from JetBlue senior leaders and Girls in Tech CEO and Founder Adriana Gascoigne and received an introduction to technical skills such as coding that are critical to careers in science, technology, engineering and math (STEM). The day kicked off with a Power Breakfast panel featuring Oscar® nominee Ava DuVernay, director of Disney’s upcoming epic adventure, “A Wrinkle in Time;” Bonny Simi, president, JetBlue Technology Ventures; and Ursula Hurley, vice president structural programs, JetBlue and board member for The JetBlue Foundation. This event launches JetBlue’s “Even More Girls” career awareness programming which brings girls and women together to showcase the range of careers available within the airline. Programming will raise awareness encourage girls and women to pursue a variety of career options including finance, IT and marketing, among others. The number of women involved in the aviation industry are still very minimal compared to men. Women pilots represent less than seven percent of the commercial pilot population and three percent of aircraft mechanics, according to Women in Aviation. Increasing these numbers requires focused educational outreach and career pipeline programs like “Even More Girls - In Tech” to ensure the future of the aviation industry. JetBlue Equals, the airline’s diversity and inclusion platform, JetBlue Technology Ventures, the venture capital subsidiary of JetBlue, and The JetBlue Foundation, a 501 (c)(3) nonprofit focused on STEM education, have a joint vision to provide access to girls and encourage careers in aviation. JetBlue supports STEM spanning the full spectrum of the talent pipeline from early education to careers in technology fields and entrepreneurship. The JetBlue Foundation was founded in 2013 and focuses on providing access to STEM programs to communities traditionally under-represented in STEM fields including women and minority groups. Beyond grants, the JetBlue Foundation also provides mentoring, internships and more to make a difference for the next generation of aviators. Overall, the airline is focused on ensuring diverse, fresh perspectives to influence all aspects of the company, particularly the technology fields that fuel the airline. This collaborative effort, JetBlue Equals, is the umbrella platform for JetBlue’s initiatives related to diversity and inclusion. In Silicon Valley, JetBlue's commitment to diversity is engrained in their approach encouraging entrepreneurship. JetBlue Technology Ventures incubates, invests in and partners with early stage startups at the intersection of travel and technology. 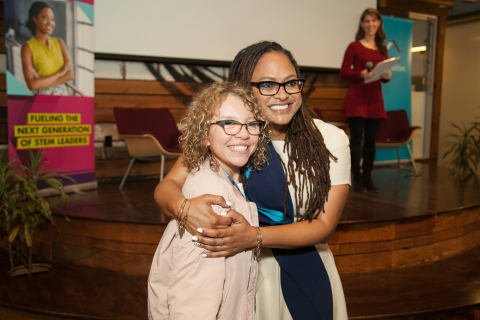 Ahead of the theatrical release of “A Wrinkle in Time” on March 9, 2018, Ava DuVernay helped JetBlue and Girls in Tech kick-off this tech empowerment initiative. A behind-the-scenes interview with the Oscar® nominated director and a trailer from the film will be available on all JetBlue seatback TVs throughout March 2018, Women’s History Month. For more information on Girls in Tech’s programming and chapter locations, visit http://girlsintech.org. Girls in Tech (GIT) is a global non-profit focused on the engagement, education and empowerment of girls and women who are passionate about technology. Adriana Gascoigne founded GIT in 2007 to create a support framework to help women advance their careers in STEM fields. GIT aims to accelerate the growth of innovative women entering into the high-tech industry and building startups. GIT achieves this through the creation of proprietary, innovative programming and strategic global partnerships. With headquarters in San Francisco and more than 100,000 members located around the globe, GIT relies on volunteer efforts to lead each of the 60 local chapters. Programming and events vary by chapter based on local interests and needs. GIT is not just for professional women. It exists for anyone with an interest in technology, startups and providing women with a platform for growth. But GIT operates with the spirit of the girl within all of us—fearless, lively and determined. For the latest updates, read GIT’s blog or follow them on Facebook or Twitter. JetBlue Technology Ventures invests in, incubates and partners with early stage startups at the intersection of technology and travel to improve the entire travel experience. The company prioritizes investments that advance the customer-centric journey; technology empowered customer service; the future of operations and maintenance; revenue management, sales & distribution; and new regional transport ecosystems. Founded in 2016, JetBlue Technology Ventures is a wholly-owned subsidiary of JetBlue (NASDAQ: JBLU) and is located in Silicon Valley, Calif. For more information, visit JetBlueVentures.com. The JetBlue Foundation seeks out programs focusing on communities traditionally under-represented in STEM fields including women, minority groups and veterans. Beyond just grants, the JetBlue Foundation provides in-kind support, mentoring, internships and more to make a difference for the next generation of aviators, dispatchers, aircraft mechanics and pilots. The JetBlue Foundation has built lasting relationships with more than 26 aviation-focused programs and provided $512,000 in grants to help these programs take off. The JetBlue Foundation, founded in 2013, is independent from JetBlue and has a separate Board of Directors and an Advisory Committee both made up of JetBlue crewmembers from across the airline. To learn more about the JetBlue Foundation, visit, www.jetblue.com/InspiringHumanity.